Ayen Makuach Panreing, 28, says she feels lucky. She lives with her family in the Mingkaman host community in South Sudan—an area where thousands of internally displaced people have sought refuge from ongoing conflict. 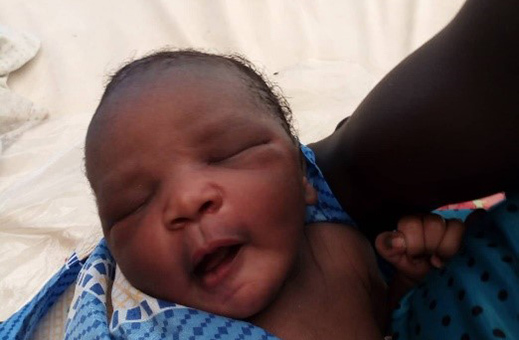 IMA World Health staff spoke with her in September following the birth of her fourth child, who was delivered at a Reproductive Health Clinic funded by the United Nations Population Fund and managed by IMA. Ayen has experienced some of the worst-case scenarios of childbirth. She delivered her first two babies at home without skilled delivery assistance, and both times she bled heavily after delivery—a complication that kills more mothers than any other cause in South Sudan. The first time she recovered without assistance, but the second time the bleeding was so heavy that she lost consciousness. Her family rushed her to a clinic run by Medecins Sans Frontieres, where she received an emergency blood transfusion that saved her life. In 2016, she became pregnant again. This time she heard about the UNFPA Reproductive Health Clinic, where IMA provides reproductive and maternal health services to more than 200 people per month. Realizing the risks she had faced with her previous deliveries, she enrolled in antenatal care at the clinic. When it came time to deliver, she gave birth to a healthy baby without complications with the help of IMA-trained health workers. After a positive experience at the UNFPA clinic, she enrolled in antenatal care again earlier this year when she discovered she was pregnant with her fourth child. She attended five antenatal care visits, receiving growth monitoring, preventive treatment for malaria and more to ensure the healthiest possible outcomes for mother and baby. On September 12, 2018, she delivered a healthy 7 lb. baby girl with the skilled help of clinic staff. But at 2 a.m., about four hours after delivery, Ayen woke up in a clinic bed and knew that something was wrong. She had started bleeding heavily. She woke her mother and sent her to get the midwife, who immediately started to give her Pitocin through an IV to stop the bleeding. At the same time, the maternal and child health worker who was also on duty began uterine massage and had the baby start breastfeeding. Thanks to these quick and skilled actions, the bleeding was quickly controlled. Ayen stayed at the clinic for two days until her hemoglobin levels had raised sufficiently. She was sent home with iron and folic acid tablets and advised to eat foods high in iron, such as greens, liver, lentils and ground nuts. In a follow-up visit with IMA, Ayen expressed her appreciation to clinic staff. IMA has managed the UNFPA clinic in Mingkaman since January 2014. The project provides essential health services, primarily for internally displaced persons, through mobile clinics and outreach as well as through strengthening local capacity to implement the Minimum Initial Service Package for reproductive health, including interventions to address gender-based violence, sexually transmitted infections and HIV services.